(Bloomberg) -- Investors rushed out of U.S. equity funds in the second-biggest weekly exit on record, according to Bank of America Merrill Lynch, as the market sell-off pushed traders to seek safe havens. U.S. stock funds bled $27.6 billion in the days through Dec. 12, which includes last Friday’s plunge in the S&P 500 Index that capped the worst week for the gauge since March, according to BofA’s note, which cited EPFR Global data. This is the second-biggest redemption since February’s spike in the VIX volatility measure, according to Jefferies Financial Group Inc. 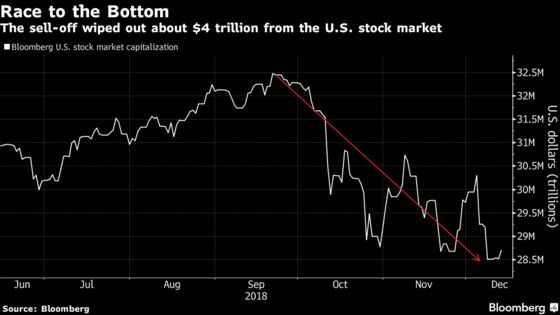 The turmoil in stocks, which has erased as much as $4 trillion in U.S. equities since the end of September, continued this month as traders feared that a global economic slowdown will curb earnings growth and end the equity bull run. Investors enter 2019 searching for assets that would bring returns after 2018 saw both fixed income and stocks disappoint. Instead of U.S. equities, market players flocked to Japanese and emerging-market equity funds, in addition to government bonds as global equity funds saw a record weekly outflow of $39 billion, according to BofA. Investment-grade bond funds also set a historical precedent with an $8.4 billion redemption, the data show. 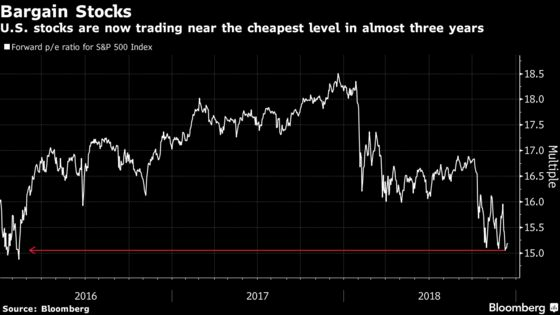 U.S. equities have fallen so much that the S&P 500 Index is now trading near the lowest valuation since early 2016. That’s quite a contrast compared to a year ago, when the gauge was at the highest forward price-to-earnings ratio since 2002. The negative sentiment surrounding U.S. stocks showed no signs of dissipating on Friday as S&P 500 futures fell. Trade concerns were fueled by Apple Inc. saying a Chinese ban on sales of the iPhone will force it to settle a licensing battle with Qualcomm Inc., an outcome that may end up harming the country’s smartphone industry.